For one type of worker, any time outside the office is time well spent — even if they're working. According to the latest Business Travel and Technology Global Survey from Egencia, the business travel arm of Expedia, 70 percent of business travelers find business trips more enjoyable than time spent in the office. In fact, the idea of traveling for work is actually becoming more of a perk for many office workers. Another survey conducted by Booking.com found that 30 percent of employees would even take a lower paying job if it involved more travel for work. The Egencia survey sampled 4,521 business travelers located in Australia, Canada, France, Germany, Norway, Singapore, Sweden, the U.K. and the US. It also found certain tastes were changing for business travelers in terms of how they preferred to book their reservations. The survey also showed 49 percent of people polled said Wi-Fi would increase their productivity. However, only 29 percent of them said they get reimbursed for it, so the idea of free Wi-Fi might be on the table as well. 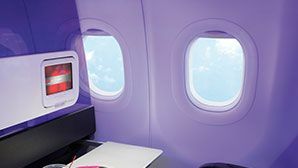 Among the other highly sought-after perks include non-stop flights, extra time off to offset time traveling, and class upgrades for flights lasting longer than six hours. With all these perks, it’s no wonder traveling for business seems so attractive.